19 “When you reap your harvest in your field and forget a sheaf in the field, you shall not go back to get it. It shall be for the sojourner, the fatherless, and the widow, that the LORD your God may bless you in all the work of your hands. 20 When you beat your olive trees, you shall not go over them again. It shall be for the sojourner, the fatherless, and the widow. 21 When you gather the grapes of your vineyard, you shall not strip it afterward. It shall be for the sojourner, the fatherless, and the widow. 22 You shall remember that you were a slave in the land of Egypt; therefore I command you to do this (Deuteronomy 24:19-22, ESV). I’m also interest in the inclusion of the olive tree in the Deuteronomy text. Olives were a staple in biblical times. Olive trees are plentiful in Israel today, requiring little water, and can be grown on almost any terrain (including land too steep for farming). Again, the Deuteronomy legislation required that the owners left whatever remained after harvest for the poor of the land. On a recent trip to Israel we spent one day visiting sites in the West Bank (PA), including Shechem. While there we saw some folks (a family?) gathering olives. The work is largely done by hand. Gathering Olives at Shechem. Photo by Leon Mauldin. Behind these folks, but out of sight, is Mt. Gerizim. Here is a close-up. 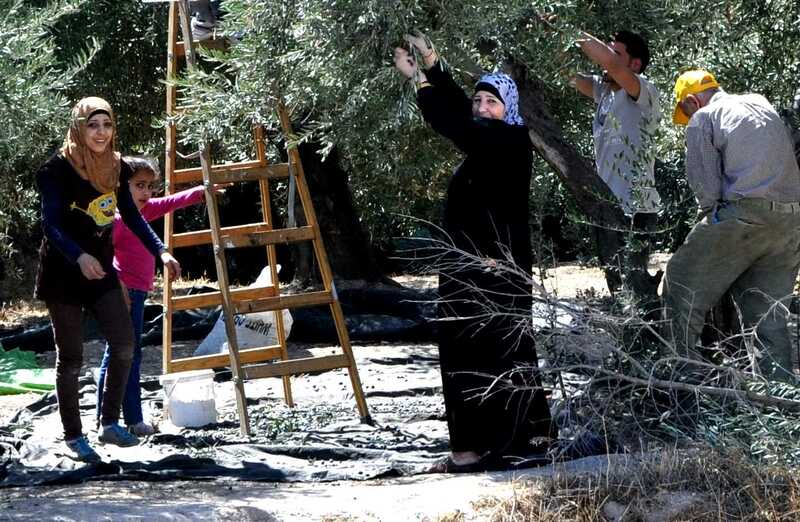 It looks like they have a tarp of some kind to catch the olives. Gathering Olives at Shechem, close-up. Photo by Leon Mauldin. I think they were looking to see who that was taking their photo, you think? This entry was posted on Friday, December 20th, 2013 at 9:43 PM and is filed under Bible History and Geography, Bible Study, Israel, Old Testament, photography, Uncategorized, West Bank. You can follow any responses to this entry through the RSS 2.0 feed. You can leave a response, or trackback from your own site.